We're less than two weeks out from Super Bowl LIII in Atlanta where the New England Patriots will once again play for an NFL Championship, this time opposed by Sean McVay and the Los Angeles Rams. While we still don't know who will come out on top, we can still speculate who will win the Super Bowl MVP via FanDuel Sportsbook. And according to the odds, there's a solid chance it'll be one of the two starting quarterbacks. 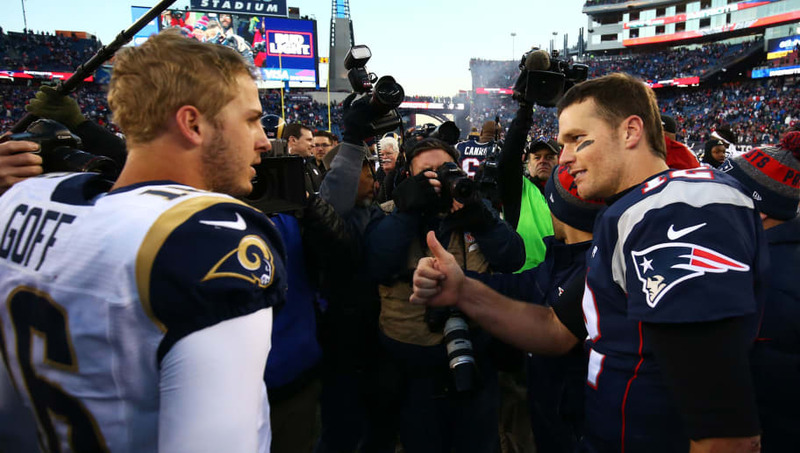 Tom Brady and Jared Goff are the overwhelming favorites at +115 and +180 respectively. The next-closest players on this list make up a pair of former Georgia running backs, Todd Gurley and Sony Michel at +2000. This seems to fit the narrative though, considering a quarterback has won the MVP 29 times in 52 total Super Bowls, which is 55.7 percent. In the past 10 years, a quarterback has won the MVP seven times. It seems to have become the position that gets the award when no one else on the winning team plays exceptionally well, and that's likely part of the reason the odds are so stacked for Brady and Goff. Brady already has more Super Bowl MVPs than any other player in NFL history with four. If he were to win again this year, that would put him two MVPs ahead of Joe Montana's three. If Goff won, he'd become the youngest quarterback to win Super Bowl MVP ever and the first quarterback under 26 years old since Tom Brady won it in 2001. Outside of the quarterbacks, everyone else is essentially a longshot, with four of the next six players as running backs in Gurley (+2000), Michel (+2000), James White (+2500) and C.J. Anderson (+2500). While they may feel intriguing, a running back hasn't won Super Bowl MVP since Terrell Davis in 1998. The only other player in the same odds range is Rams DT Aaron Donald at +2500. Donald could be a decent longshot given the fact that two defensive players have won the award in the past five years. If he can ruin the game for Brady and force a turnover or two on the way to a Rams win, he has a shot.